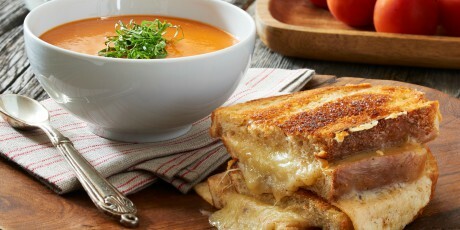 Melted white Cheddar and mozzarella sandwiched between thick sourdough bread, served with a smoky tomato soup. 1. Preheat a tawa or cast iron pan over medium heat. Preheat oven to 275°F. 2. In a medium bowl, combine the grated white Cheddar and mozzarella cheeses and season mixture with a pinch salt and pepper, and cayenne pepper if you so desire. Combine well and set aside. 3. For each grilled cheese sandwich, proceed as follows, cooking as many as you can without crowding the pan and not compromising even heat along the pans surface. Generously butter each slice of bread on one side, making sure to evenly cover the slice end to end, and season each buttered side lightly with salt and pepper. Place one slice, butter side down, onto heated cast iron pan. Spread 3⁄4 cup of cheese mixture evenly over the slice (make sure the cheese goes end to end) and top with second piece of bread, butter side up. Season top side of buttered bread with a pinch of salt and pepper. Cook low and slow, letting butter gently crisp up the bread until dark golden. (Be patient! This will take 4-5 minutes.) Carefully flip the sandwich over and continue to cook the other side, until cheese is nicely melted and the bread is crisp and golden on second side, another 4-5 minutes. Remove from heat and place on a baking sheet in low oven to keep warm while preparing remaining sandwiches. 4. Serve warm, with a hot bowlful of Tomato Soup below. 1. In a medium pot over medium high heat, add oil, basil leaves and onions. Sauté without colouring (stirring often), until onions are soft and sweet, about 7-8 minutes. Add diced tomatoes and gently cook another minute. Add potatoes, vegetable stock, chipotle pepper and salt. Bring mixture up to a low simmer, stirring occasionally. Simmer, uncovered, until potatoes are cooked through and tomatoes have melted down, about 10-12 minutes.